India Lee made short work of the fourth cat race last week and repeated the trick again this time around with the E/1/2/3 race, taking the win in dominant fashion with an early attack. Lucy Driver (Forever Pedalling) was able to hold the Hargroves-Ridley-Montezuma’s rider’s wheel the longest and got her reward with a second place finish, despite being caught by the main chasing bunch. Lee did not hesitate, lighting the race up on the very first lap and stretching out the bunch behind her. Marking the step up Lee has made from fourth cat, the bunch were not rolling over and held the gap to the flying leader to only a handful of seconds for the first couple of laps. But as the elastic finally snapped, Driver was the only rider who was able to stay with Lee as the bunch fractured into small groups behind. Lee was not going to settle to ride with company for long however, and finally dispatched Driver a short while later with another attack to go solo; a lead she would hold and extend all the way to the chequered flag. Driver’s task was now to hold off a regrouping bunch behind, as Charlotte Berry (VeloVitesse) and Aimee Parsons (Avid Sport) were reeled in by the chasing group of Molly Hodges (Avid Sport), Ashia Fenwick (VC Venta) and Stephie Prince (VeloVitesse). These five riders set to their task well, and as Driver started to stall out in front it looked like the catch would be made in the final laps. Indeed, second place was up for grabs as Driver was caught with just over one lap to go; it looked like a fantastic opportunity for last week’s runner up Berry to take the sprint. 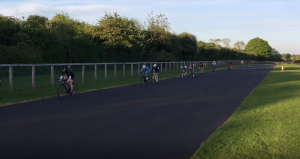 However, Driver has won a Winter Series round at Odd Down from a bunch sprint and showed her speed again, despite all the laps ridden on her own, to pip the group in a close finish. Berry came in just behind in third. In the fourth cat race, there was another dominant solo victory, this time from Avid Sport’s Fran Bromley. Aided by the presence of her teammate Joanna Goodhead, Bromley was well protected in the group until she made her move approaching halfway through the race. Bromley jumped clear and in similar fashion to Lee last week, rode her lead out significantly as the race wore on to take a comfortable win. The group behind were content to fight it out in a sprint finish, with Laura Wells (Mickey Cranks CC) taking second ahead of Janet Horton (UCY). The Master’s race took a similar form to last week; Miriam Whitehurst (Somer Valley CC) and Maria Powell (Radeon-Cycology RT) taking out an early lead against Karen Whyte (VeloVitesse) and Karen Spiteri (Avid Sport) and setting up what resembled a 2-up pursuit race. The final sprint for the win went the same way as well, with Whitehurst beating Powell to the line, whilst Spiteri took the sprint for second from the chasing group. These results make things very tight at the top of the series standings, with Berry and Driver now tied on 85 points, only five ahead of Lee in third. A strong showing and good numbers from Avid Sport and VeloVitesse also sees them move up the order at the top of the team standings; with Avid Sport retaking the overall lead from Bristol RC and VeloVitesse climbing from fifth after the men’s races on Tuesday back to third overall. Driver’s second place moves Forever Pedalling up to fourth.